BerryStats began as a project of Brent Grim which has now been updated and made a bit more useful by maximillian from Confessions of a Freeware junkie. 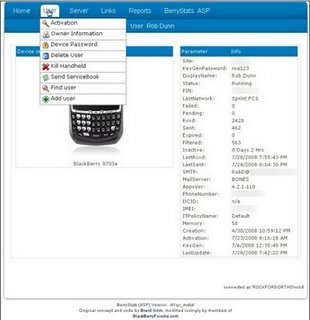 So basically, what the entails is an administrator that is running IIS with ASP support, have relative server paths enabled, and have the BlackBerry server going and on the client side be using Internet Explorer or BlackBerry Browser. What this does is, it allows an administrator to actually list server statistics, list keys, kill a handheld, list and count keys, and a whole bunch of other things, but the key here? Straight from a Blackberry browser. Which is pretty sweet. It basically gives you a lot more statistics and functionality as a BSE administrator. And anyone that has actually been a BSE admin knows that it’s pretty much a pain in the rear. In any case, if it looks like a fit with what you do, you might want to take a look at it since it sure looks inviting when it comes to Blackberry services. You can track the beta here.